As temperatures rise in Milwaukee, icing on some roads and bridges may be a concern over the next few days. High temperatures in Wisconsin this weekend are expected to be about 50 degrees warmer than the highs just a few days ago. While the high Wednesday in Milwaukee only made it to minus 10, highs on Saturday and Sunday are expected near 40 degrees. This may be cause for community celebration. But there are agencies and forecasters urging you to temper your enthusiasm. Lori Getter, of Wisconsin Emergency Management, says if you are traveling this weekend, pay attention to changing conditions. "There is a chance of freezing rain over much of Wisconsin Saturday afternoon, evening and Sunday night. That could cause some black ice conditions. It may look clear and dry. But again, if you hit that black ice, you will be sliding," Getter says. She added that fog may also be a concern. "When you have all of this snow that's piled up on the side of the road, the sun is going to get to it, or the warmer temperatures melt it off onto a pretty cold bridgedeck, for example. Now, you've got icy conditions, because the snowmelt doesn't have anywhere to go." Westendorf says rain may especially hit Milwaukee on Monday. "It probably will be a pretty messy situation. Then we fast-freeze Tuesday, as we get another shot of colder air." Temperatures above freezing this weekend could lead to ice falling from Milwaukee-area buildings. While not nearly as cold as a few days ago, it is still below freezing. One more concern is from the Milwaukee Water Works. 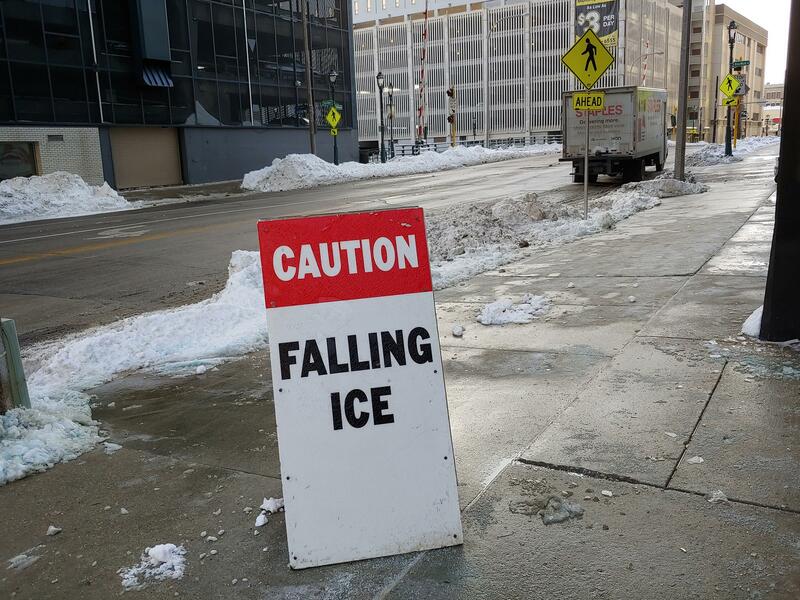 "The freeze and thaw cycles expected in February are likely to cause an increase in broken water mains,'' a press release from the city of Milwaukee begins. But after the dangerous cold of this past week, maybe that's a risk southeastern Wisconsin residents are willing to accept.